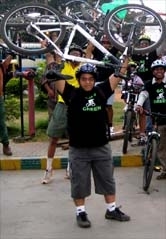 Go Green Campaign Ride towards Ulsoor Lake 06 March 2011 - GGI-Group size: 4000+ Professionals, Increasing on day to day basis, Come & join us 2 serve Mother Nature. 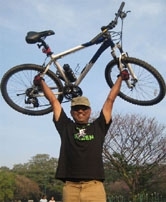 6 Mar 2011 Go Green campaign Ride was planned towards Indian institute of science but since their was an ongoing event within the premises hence we didn't got the permission. Hence decided to move towards Ulsoor Lake. Their were 17 GGI's participated in this event, Started from RIS junction at 6:40am & reached Cubbon Park central library @ 7:20am where other GGI's were waiting. 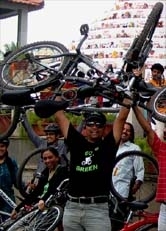 We had a guest who is cycling all the way from Mumbai with his message of Going Green. www.GreenCycleGreenEarth.com, We had our breakfast @ Shanti Sagar which is opposite to the ulsoor lake and then headed towards Chinnaswammy stadium where few of media people were waiting to capture our cheer up supporting India.. then dispersed. 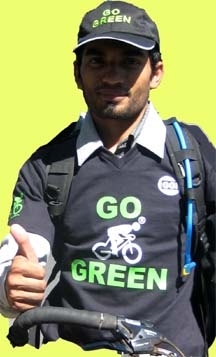 committed to sustainability GreenCycleGreenEarth is a Journey for Green,Sustainable and Peaceful future lead by Vaibhav Desai; an Adventurer,Explorer & Eco campaigner who has love for exploration,culture watch,Religions and is committed to sustainability. 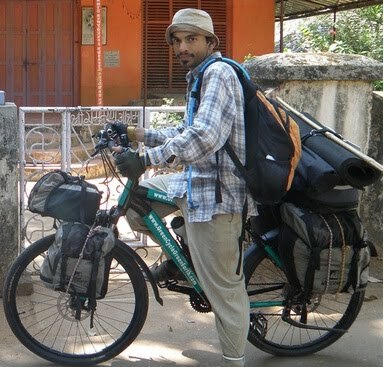 He is currently on a Bicycle expedition covering all the states of India and 50 countries across three continents(Central Asia,Europe & Africa) . RIS/Coffee day junction -Jaynagar 4th Block - Jnagar 3rd block -Sount end Circle - Patalamma Temple St - Madhavarao Circle - Vasvi Temple Rd - Sajjan Rao Circle - Karanataka Auto Consultants - Minerva Circle - JC Road - Town Hall - Hudson Circle - Cubbon Park - MG Road - Ulsoor Lake - MG Road - ChinnaSwammy Stadium.